Print magazine is great. App is horrible. It will not let me sign in. Contacted customer service twice. No response. Maybe someone will get back to me from this review?? Doubtful. I am not able to open this app anymore. I hit the icon it opens for a second then closes. I’ll give 5stars if I can read it again. I really enjoy the magazine. Any advice on how to get this to work again? I loved the old interactive format, looked forward to it every month. Content is still good, but the Magic is definitely gone. Also, not having live links in an e-zine is frustrating. So that’s the bad. The worse is, starting this month the App crashes on opening. Can’t even read the magazine at all! Verifying a subscription is convoluted, but at least they give print subscribers digital editions now. Like everyone else, I'm unable to login. It's so disappointing! Same as the rest of the reviews cannot access the account. It does not acknowledge my password as correct. I login online to access my account subscription with the same info and I am able to login but not on the app it gives an incorrect password message. So dissatisfied. Please fix this issue. Works great IF you have print subscription. love that I can extend size of picture, change room colors to see different palettes and even videos with tips. And a recipe index. Great. What happened to the pinch-zoom feature? Some of the print is so small I can't read it any more. So disappointing. Tried to sign on and it went nowhere. This app is terrible! Recommend that you don't get unless it has been better made. Not good quality! This app is easy to use and digital mags look great. Print subscribers get free access to digital versions of app. You just need to log into the section for print subscribers and follow instructions. Then you can download the digital versions of the magazine you subscribed to. I think this is great because I don't have to scan all the articles/recipes I want to keep, plus you get to lounge and read the hard copy if your'e used to that, plus you can give it away. Terrible app. Took two days to figure out how to log in and the only thing I got was an electronic version of the print magazine I just read. What is the point? Don't launch an app that can't handle the simplest of functions like logging in. I already have a subscription, and have spent the last hour or more trying to log in successfully. Waste of my time! OOPS...review written to wrong app. I hope someone can catch it...meant it for the Lowes magazine app. Need second cup of coffee. EVERY month I need to to do cartwheels to access my subscription. I'm 'signed in' but cannot download the current edition. Sometimes passed additions are not available. If you email Meredith, don't expect an answer. Not a huge fan of the navigation bar that stays up on the side of each page (except ad pages, of course). I have an ipad mini so every little bit of the screen is valuable real estate. There's already a navigation scroll bar when you tap on a page, anyway, so it's redundant. If you must have the shortcuts to certain sections, why not add it down where the scroll bar is so it's all hidden? That would be much more desirable. It seems like a small thing, but bugs me so much. Other than that, I love the magazine. I'm a physical subscriber so I have access to the digital ones as well, which is absolutely lovely. I like the interactive mess of certain pages too. There's just enough without it being overdone. So much fun to read a magazine that takes advantage of the use of the iPad Air! Beware!!! Do not waste your money buying this app!!! I purchased a one year subscription and every single month I have major issues trying to download the new edition. Four months into my subscription I've been blocked, can't read old or new issues, and have written customer service three times in two weeks with no response. (Well, you do get a canned response saying customer service will get back to you....but as I wrote, it's been two weeks with no resolution.) As for the quality of the magazine itself, I think they just scan the pages on a two-cent scanner. Unlike other magazine apps, there are no extras such as video, links, special features, etc. Horrible app, horrible customer service, so-so magazine. I'm using the correct login and password, but I cannot log in. Please fix this. I deleted the app after I realized I had to purchase a subscription even though I already subscribe to the print edition. I don't want to pay twice for 2 copies of the Same magazine. It's a good magazine if u really now how to deal with it. App works fine for me. Little + symbols allow you to get more info when you want it. Small directions permit scrolling to more info. It's a great 'clean' way to see the pictures then look further if you want more details. Also, I can now flip thru the magazine in the early morning without waking him up. Easy to navigate. Just follow the instruction and enjoy all the issues. Thanks. I love, love, love the BHG app -- it's my favorite magazine app because of the interactivity of it. It is fun to change colors on the furniture and walls of certain articles, to see what fabrics and wall colors go together. But right now, I am not able to open the app. Every time I touch it in the Newsstand, it refuses to open. Please fix! When the iPad updated, I lost all of my downloaded digital mags - I have been a print subscriber for over 10 years. I wrote asking for help so I could get them reloaded and told them I wanted to switch to digital only. Well, they switched me all right but now I am told that I can't download my old ones because that account no longer exists and I should have downloaded before I switched - duh, that's what I asked for help with. They didn't tell me up front that I would no longer have access to my old ones. And no, I don't have the print copies any more since I donated to the hospital as I received them since I would be able to get digitally! So if you want to switch - make sure you have all your back copies first! Like other users, I have also tried to login to my BHG account. It is not accepted in the app, but it is online. I also am having trouble downloading the May issue because for some reason my login is required. Once again, the login information is either not accepted or I need to enter my print subscription if formation, which I don't even have as I have on,y ever been a digital subscriber. I have emailed the BHG help people, and I hope they can fix this soon because I love this magazine! I did enjoy the digital magazine. (It was included with magazine). Then, it ran out. I renewed my magazine subscription thinking I'd have them on iPad again. No. They are separate subscriptions now. And, too expensive for me. Whether passing time in a waiting room or when traveling I can have all my issues on one device. In both formats BH&G is still one of my favorite magazines. I paid for the regular & digital subscription, which is a bust. I feel like I wasted money. The digital subscription is tripping. On a fast & reliable internet connection & it still takes forever to download ONE month! Even after it downloaded, I tapped on "view" & all the pages are gray with a big blue "downloading" message in the middle of the screen. There's no content, people. Don't let them trick you like they got me! So mad right now. This app is great... When it works. It regularly loses my library and then wont recognize my login and password. Takes several emails to get it straightened out! Biggest wast of money!!!!! I also can not log in since the update and there is no longer the option to read landscape. DO NOT waste your money!!!!! I've had more issues with my account and downloading the magazine that actually enjoying it. The app has some live features like seeing the whole page without any text or ads, but that's about it for me. If I paid for a subscription (and that's probably irrelevant), why can't subscribers or anyone for that matter see an option for special additions? I'm ok with paying more for them, but they aren't even "available" to see. tried to open on iPad with keyboard attached and it doesn't adapt to horizontal/landscape viewing. very clunky and tried 4x times to get to home screen and couldn't get pass the Pier1 ad - very frustrating. It's good to be able to get Better Homes and Gardens on my iPad. But it keep losing its ability to get the newest edition of the mag it come up as for sale not as my subscription. I have to fool around to get it loaded on my iPad. It should just come up when I open my library. I have several Meredith Publishing subscriptions and have tried to use one email address and one password. It works for awhile then for some unknown reason I have to reset a password one app/website. Then the others don't work. Please let me use one email address and one password for all Meredith Pub. e-subscriptions.. I thought most of the “interactive” stuff was folderol and appreciate the streamlining. Photography is great digital work and I like the ideas and products within the features. I also appreciate that decorating ideas are financially viable, not outside the range of most people. Inspiring without being over the top. It's very informative and i am enjoying the magazine a lot. As much as I love my hard copy of BHG, there is definitely something very cool about the digital version -- especially the ability to forward special items to others! Looks great on my iPad. Thanks for making all of the articles available wherever I go! I love the magazine on my iPad. It is so bright and all the little extras are fun. Perfect for waiting in the doctor's office or airport. Please create a similar app for the iPhone. I now have an iPhone 6 plus and yours is one of the few magazines that is not supported on the iPhone. It won't let me log in although I enter my information exactly as it is on my label and on the website. I've tried many times by address and by account number. I can log on to my other Meredith magazines. I like having my magazines tag along in the car when I go away, without having a stack of them with me. The app is great for that? I like all the little electronic extras supplied in the online version of the magazine. I have been a loyal subscriber for many years. Come to find out that I now have to pay for the digital version. When I renewed my print subscription it came with the digital version. Bad practice of BHG to all of a sudden yank away the digital version of this magazine when it was part of the deal. I used to be able to get the magazine on my iPad and loved it, but no longer. I renewed my subscription which included two year e-subscription, but for the last three months have been unable to access the current issues in my iPad (they only show issues for sale). I've contacted customer service 3 times and each time they told me to sign in as the problem has been corrected; still no magazine access. I recontacted customer service over a week ago and this time haven't even gotten a response. Very disappointing! After signing in with a current subscription, you are told you have digital access. When you access your library, there are no issues to download, only to purchase. Customer service is horrible. The electronic version is even better than the paper magazine. Loaded with lots of extras. Check out the color changing decorator rooms, printable recipes and extra items on the main web page. Works great with iPad on and off line. Help. I tried to download the current magazine with the latest iPad operating system. The first few pages loaded fine, but the majority of the magazine is just a series of low resolution graphics. Not interactive, very blurry. No way to remove the October issue and try again. No FAQ, no online help. Where can I find out how to resolve this problem? This a great app. & fantastic home design magazine. Terrible! Always crashing, can't seem to stay logged in and doesn't remember my subscription. Hate it. I'm old fashioned and prefer the print version, but it’s nice to just carry the iPad on vacation. Also, the pictures are more saturated with color, and some of the instant connections with other sites are nice. I enjoy the different ways that I can see the content. I've had a few small problems with not being recognized that I'm up to date on my subscription, but I haven't needed to call customer service or tech support. I do wish landscape view was supported. I also wish this was included as part of my print subscription, as another magazine does. Overall, I'm satisfied with it. I've always enjoyed Better Homes & Garden magazine and now with the tablet version included in he subscription it is even better! I enjoy the app and it makes it a nice interactive experience. My only issue is with ads that make you click in certain spots to get to the next page. I find that annoying but understand why they're there. Have had the BH&G app 3 years. Enjoyed using it when I traveled or at the doctors office. Used it in conjunction with my hard copy magazine because I could save articles and try out colors and see helpful videos. Just renewed my magazine subscriptions and find out the app magazine no longer comes with those subscriptions. I have to subscribe again! Shame on you Meredith Publishing. From a faithful subscriber for over 10 years, SHAME ON YOU! 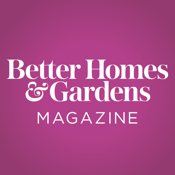 I love the eMag from Better Homes and Gardens. They have great interactive features and I don't have to figure out what to do with an ever growing stack of old magazines. Best of all, I can review old issues anytime I want! The app is easy to navigate. It's all the good content I wanted, only better. This app/mag gets blurry after about the 20th pg. so blurry it's unreadable. Very disappointing, I can't enjoy my digital subscription bc of this problem. I've been a faithful subscriber for over 35 yrs! now come to find I can no longer get the digital editions. I have to subscribe to get the digital now. Unbelievable!! It's all about greed, shame on you, BH&G! When this subscription expires, I'm done! This app makes the digital edition even better than the print version. Interactive features like Color a Room are fun to play with, and live links to shopping and other sources just make the reading experience that much more enjoyable. BH&G is a great app - easy to use, fun to play with, and dependable. What could be better?! I wish they would roll back changes, as the changes make it harder to read without expanding the page. Wish there was a print option. Paid for subscription and several years of online magazines that I cannot open. Used to work but no longer. Refund? Use it on my iPad and love it, I've subscribed to BHG for 30 or more years and love the e version best. Stick to reading the actual magazine, the app leaves a lot to be desired. You can't save articles within the app or to another app (Evernote, OneNote, notepad, etc). Not all articles are favorite-able and if you do favorite an article you have to keep that issue, if you delete the issue you lose that fav. So if you're a forever reader kiss your space goodbye. Unable to save recipes. If you select share/print it errors out. Their answer is to go to the website to get the recipe. If I need to use the website then what's the purpose of the app. Every other reading app I have used allows me to highlight and my highlights are noted so I can get to them and use them how I wish, has allowed me to copy /paste, paste to Pinterest, etc. There's always an option to save just this piece and get rid of the rest. Not with this. Thankfully I still enjoy my print issues. Uninstalling. I’ve been using the app over a year. Works great. Love reading it on my ipad. Like the fun animated graphics and extra features like videos that you don’t find in the magazine. Horrible. Crashes 24/7, and locked orientation.. Don't buy this!! This is the worst app I have on my iPad. My subscription doesn't end until Jan '16, but the app repeatedly asks me to buy issues that should be included, to the point that I can read the most recent, but the previous 3 have price tags. And to make matters worse, the 'help' button repeatedly says server not available. Have always loved the magazines, but unless they get their act together on this app, I won't be renewing in January. Keeps kicking me out. Then I have to start over at he cover to get back to where I was. Not fun. I love this app, and it's extra information it gives on each page. I have bought paint just from the suggestions they have. I have even tried some of the recipes. Love this. I've been a BHG subscriber for several years, and had print and digital access for at least two of those, now it won't let me verify my subscription ANYWHERE!! And I've sent two customer care requests through the iPad app, and have yet to hear from anyone!! I went so far as to pay for digital access, (I never needed to before), and it still won't let me access anything, it still wants me to pay?!?!? Wth, this is NOT the hassle avid readers want OR need this close to the holidays!! Paid for a subscription but the app won't recognize it. Won't work on my phone or iPad.